Saddled with a man’s name, Billy Jack Tate makes no apologies for taking on a man’s profession. 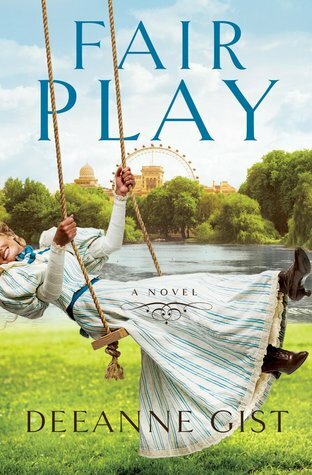 As a doctor at the 1893 Chicago World’s Fair, she is one step closer to having her very own medical practice—until Hunter Scott asks her to give it all up to become his wife. Hunter is one of the elite—a Texas ranger and World’s Fair guard specifically chosen for his height, physique, character, and skill. Hailed as the toughest man west of any place east, he has no patience for big cities and women who think they belong anywhere but home. Despite their differences of opinion, Hunter and Billie find a growing attraction until Hunter discovers an abandoned baby in the corner of a White City exhibit. He and Billy team up to make sure this foundling isn’t left in the slums of Chicago. As they fight for the underprivileged children in the Nineteenth Ward, an entire playground movement is birthed. But when the fair comes to an end, one of them will have to give up their dream. Will Billy exchange her doctor’s shingle for the domesticated role of a southern wife, or will Hunter abandon the wide open spaces of home for a life in the “gray city,” a woman who insists on being the wage earner, and a group of ragamuffins who need more than one breathing space? There is a well know fact about me that some of you may not know, especially when you look at my TBR pile and see lots of YA books or NA reads or even my shelf full or PNR and UF, and that fact is, I am a sucker for a really good historical romance and usually I wait way too long between reads before I sneak one in. But when I do, Gist is one of those authors that I know I can go to for a great fulfilling one. One that will sweep me back in time and transport me to a different time and place and make me love every single minute of it. Another thing I love is a good feisty heroine. I do not like my leading woman to be MarySue's regardless of what time period I am reading. There is nothing wrong with a woman that knows what she wants and is willing to fight for it to get it. Someone who stand up for those they love and for themselves. Gist can create those type of woman and you can't help but fall in love with them. And trust me on this one, Billy Jack Tate is the kind of heroine you will love. She has all the qualities of a modern woman living in a very unmodern world. She is strong, smart, fierce, loyal and determined. I liked her right away and my love for her only grew as the story progressed and her character grew even more. Hunter is also someone that I defy anyone to not fall in love with. He is charming, sweet, a true gentleman, and come on now ladies, he is a Texan cowboy with all the quirks and funny sayings that go along with it, not to mention the armadillo boots. I love how Gist blends the right amount of story with romance and always, always has her books filled with rich (true) historic detail. The circumstances and life in the West of Chicago was truly heartbreaking. The jails, revolting and sadly, all of it was true. The one bright spot in it all was the very fact that Ms. Addams and Hull House were real and very much as fantastic as the story portrayed them to be. Without her and her volunteers life would have been so much worse for so many. Once again Gist reminded me why I love her stories, her writing and why I will always depend on her work to give me exactly what I want when looking for a good historical romance that will blow me away with how invested I become in the characters and their outcome, you can't help but root for them to get their happily ever after. I love a good feisty heroine too. And you've made me very curious about this Hunter now. Armadillo boots?! ;) I'm glad you had fun reading this. Historical romances very rarely make it onto my pile, but I do enjoy reading them when they do. I'll definitely keep this in mind for later. I like that it's a stand-alone as well. Great review! I don't read a lot of historical, but now I know which author I should check-out next time the mood strikes. Great review! I hope you do, her books really are fabulous. Awesome review and like you I prefer strong, feisty woman who know their mind. I have read Gist and enjoyed her. I love the cover. Yep they are a must for me, especially in this time period for some reason. I'm not big on historical books but I'm definitely checking this author out! Great review! Yes Ali! I'm a huge fan of historical romance as well and often need to pick on up to give myself a break from all the YA:) This is not an author I'm familiar with, but from the way you describe Billy and Hunter she's clearly someone I need to try. Thanks for the recommendation! I confess it's the same for me even if I'm a huge fan of UF books, I love to read a good historical romances, I love them more and more. I confess this one is a new one to me but I should check this author out. Thanks! This does sound good! I'm not always up for historical romance, but some I do really enjoy and this one sounds great! I like a good historical romance and I was curious about this one but steered away when I saw the publisher, Is it a Christian romance? it is a clean romance but by no means religion based. I think you would like this one Heidi. Oh oh oh! Okay, so I pretty much love everything about the 1893 World Fair for so many reasons. I have It Happened at the Fair but haven't read it. Lame, I know. So I think it's safe to say that I'll get this one too. Sweet! The fair plays a small role in the whole thing Christy so don't be disappointed! I am not a huge fan of historical romance, though I do enjoy a good one from time to time, and this sounds like it fits the bill. Great review! I love the sound of the characters. :D I like my female leads that was as well. Oh I hope you do!! Have you tried Julie Klassen? She is also fantastic! Waiting on Wednesday (WoW) Pick of the Week!